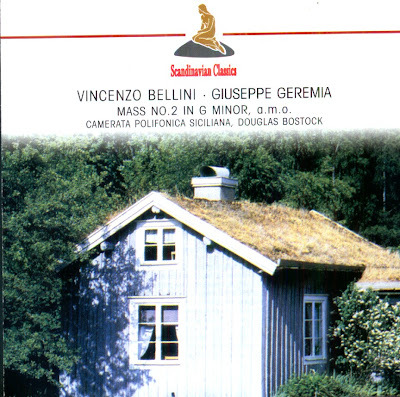 Mass in G Minor by Vincenzo Bellini: Bellini's sacred works do not seem few, or of little interest, as there are more than thirty such compositions, thanks to the unique conditions in which the Catanese composer worked. Not only was his contact with sacred music early and long-lasting, as he was the son and relative of musicians employed by the Church, but the inevitable spirit of emulation made it so that his first efforts were destined for this area. While the Mass in A Major, in all probability composed in 1821 and published in 1843 by Ricordi, has been familiar for a long time, the G Minor Mass was made accessible by Francesco Pastura, who, in 1959, edited a reconstruction based on autographs held in Catania and Naples, published by Edizioni Drago de Magenta. According to a Catanese scholar's supposition, the second Mass ought to be associated with the occasion when Bellini, after his diploma was brilliantly signed and crowned with a performance of Adelson e Salvini in the small theatre of the Collego, "was invited to compose (...) for the church of Gragnano", where a cornerstone, unveiled in 1881, cites the composer's having led the work in July of 1825 for the Feast of the Madonnadel Carmine. In fact it is a Mass in which the persistent agogic of the Allegro, with varied shadings and with a unique exception is entirely appropriate for the Marian festivity. Giuseppe Geremia has almost been completely forgotten, as there are but few references attesting to his existence (Catania, 1732 - Catania, 1814), yet a substantial musical output still speaks for him. The Missa was most likely conceived for the Benedictine church where Geremia was engaged. The practice of the day used elements of the melodramatic style and of the Cantata to modify the form and character of Roman liturgy, becoming an alternating sequence of choruses, arias, duets and recitatives, supported by an instrumental accompaniment. The year Tantum Ergo was composed is not known but the style adopted vy Geremia, which resembles early Classicism through its reference to the lesser sacred works of Haydn and Mozart, leads one to suppose that it was in all probability composed around 1770. The CD was released by Scandinavian Classics, 2002, (DDD).